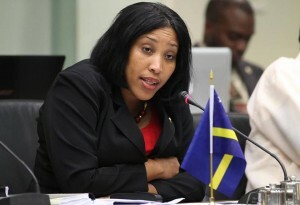 WILLEMSTAD – Member of Parliament for MFK, Jacinta Scoop-Constancia believes that the Minister of Social Development, Labor and Welfare, Jeanne-Marie Francisca should create more jobs for young people. “Ban krea trabou pa e yu di Kòrsou” (Lets create jobs for the Curacaoans), she said during the general meeting of parliament. Scoop-Constancia is concerned about the high unemployment, especially among the youth. “The figures from the Central Bureau of Statistics (CBS), the Central Bank of Curaçao and Sint Maarten and the Curaçao Center for Knowledge Vocational Education and Industry (KBB) has shown that the economy grew by only 0.1 percent in the last twenty years,” the MFK member indicated. In other countries of the region the growth was, according to Scoop-Constancia, equal to 2 to 3 percent. According to the MP, the 80-20 rule, the bill, which stipulates that businesses should hire 80 percent local labor, has little or no effect on youth unemployment. Namely the rule provides no job guarantee for young people. Scoop -Constancia hopes that the minister may provide a solution to these problems and also wants to answer the question of how they will handle this.